1. For the spaghetti, bring a large pan of water to the boil. Meanwhile, cut away the thick stalks from the spring greens, roll up the leaves into a tight bundle and finely shred. 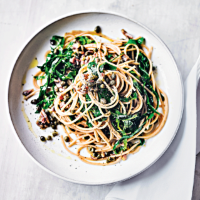 Chop the anchovy fillets and mix with the capers, garlic, olive oil, lemon zest and juice and freshly ground black pepper. 2. Add the spaghetti to the boiling water and return to the boil. Cook for 8-10 minutes or until just tender. Add the spring greens and cook for a further 2 minutes until tender. Reserve a ladleful of the pasta water, about 100ml, drain the greens and spaghetti in a colander and return to the pan. Add the caper mixture and reserved pasta water and mix. Pile into shallow bowls to serve. This recipe was first published in Tue Oct 09 09:03:18 BST 2018.